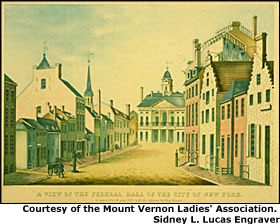 On a cold January morning, the President rode in a carriage drawn by six horses from his residence on Cherry Street in New York to Federal Hall for a joint meeting of the two bodies of Congress, the House of Representatives and the Senate. When George Washington personally delivered the first annual message to Congress on January 8, 1790, he was aware of his constitutional duty to deliver his message and of the precedent he was setting for future presidents. George Washington rode on a carriage driven by six horses from his house on Cherry Street to Federal Hall in New York to give his deliver his first annual message in person. The President’s focus, however, was on the very concept of union itself. Washington and his administration were concerned with the challenges of establishing a nation and maintaining a union. The experiment of American democracy was in its infancy. Aware of the need to prove the success of the “union of states,” Washington included a significant detail in his speech. Instead of datelining his message with the name of the nation’s capital, New York, Washington emphasized unity by writing “United States” on the speech’s dateline. Since Washington’s first speech to Congress, U.S. Presidents have “from time to time” given Congress an assessment of the condition of the union. Presidents have used the opportunity to present their goals and agenda through broad ideas or specific details. The annual message or “State of the Union” message’s length, frequency, and method of delivery have varied from President to President and era to era. For example, Thomas Jefferson thought Washington’s oral presentation was too kingly for the new republic. Likewise, Congress’s practice of giving a courteous reply in person at the President’s residence was too formal. Jefferson detailed his priorities in his first annual message in 1801 and sent copies of the written message to each house of Congress. The President’s annual message, as it was then called, was not spoken by the President for the next 112 years. The message was often printed in full or as excerpts in newspapers for the American public to read. The first President to revive Washington’s spoken precedent was Woodrow Wilson in 1913. Although controversial at the time, Wilson delivered his first annual message in person to both houses of Congress and outlined his legislative priorities. With the advent of radio and television, the President’s annual message has become not only a conversation between the President and Congress but also an opportunity for the President to communicate with the American people at the same time. Calvin Coolidge’s 1923 speech was the first annual message broadcast on radio. Franklin Roosevelt began using the phrase “State of the Union” in 1935, which became the common name of the President’s annual message. Roosevelt’s successor, Harry Truman, also set a precedent in 1947 when his State of the Union speech became the first to be broadcast on television. Most annual messages outline the President’s legislative agenda and national priorities in general or specific terms. James Monroe in 1823 discussed the centerpiece of his foreign policy, now-known as the Monroe Doctrine, which called on European countries to end western colonization. Lincoln famously expressed his desire for slave emancipation in 1862, and Franklin Roosevelt spoke about the now-famous four freedoms during his State of the Union message in 1941. Whatever the form, content, delivery method or broadcast medium, the President’s annual address is a backdrop for national unity. The State of the Union gives the President an opportunity to reflect on the past while presenting his hopes for the future to Congress, the American people and the world.